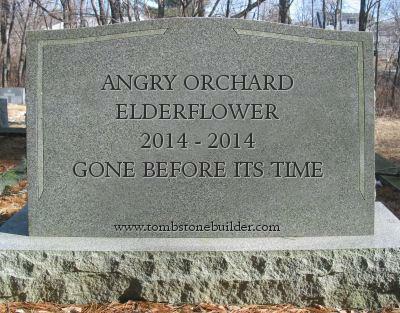 My love for Angry Orchard’s Elderflower seasonal release is well-documented here on Bad Rider, so it should come as no surprise that anticipation of its return was a major part of my excitement for the 2015 summer seasonals to start appearing. Rather than bring back last year’s practically-perfect-in-every-way seasonal release, Angry Orchard decided to mix things up and release something different this summer. Their “Summer Honey” seasonal isn’t terrible. It’s fairly generic, tasting very much like Angry Orchard’s regular offerings, with some slight honey notes to the aroma and taste. In fact, if you’re the kind of person who doesn’t like ciders with more powerful honey influence, you may still find it worth your time to give this one a try, as it’s quite mild. That said: it’s no Elderflower cider, that’s for sure. You may as well be drinking regular Angry Orchard, or better yet, something local from a small cidery. Want to try it? Find it wherever you usually find Angry Orchard. Me, I’ll be over here sulking with a Crispin and a dash of St. Germain to fill the Elderflower-shaped hole in my heart. Posted in Cider. Tagged angry orchard, seasonal, summer honey. It’s summertime, which means all manner of fruits and veggies and flowers and trinkets at the various farmer’s markets scattered throughout the Seattle area. In the past, I’ve been known to buy a truly outrageous amount of blackberries at the market near work on Thursdays, intending to use them in pies and cooking, but usually they end up unceremoniously dumped in a bowl and eaten as-is. This summer brings us not one, but two berry-themed seasonal/limited-release ciders (actually, probably more than that, but these are the ones I’ve found so far) — Seattle Cider’s PNW Berry and 2 Towns’ Throne of Thorns. I’ve pitted them against each other for your (and my) enjoyment and edification. Color: Seattle Cider gives us a lovely rosy peach color in the PNW Berry, while 2 Towns goes for a much more dramatic garnet. Aroma: 2 Towns has a strong aroma, sweet-tart and fruity, while the PNW Berry has very little in the way of aroma at all, just a soft hint of sweetness. ABV: PNW Berry clocks in at 6.9% to Throne of Thorns’ 6% even. Flavor: These two ciders are a great illustration of how you can go very different places from a common start. 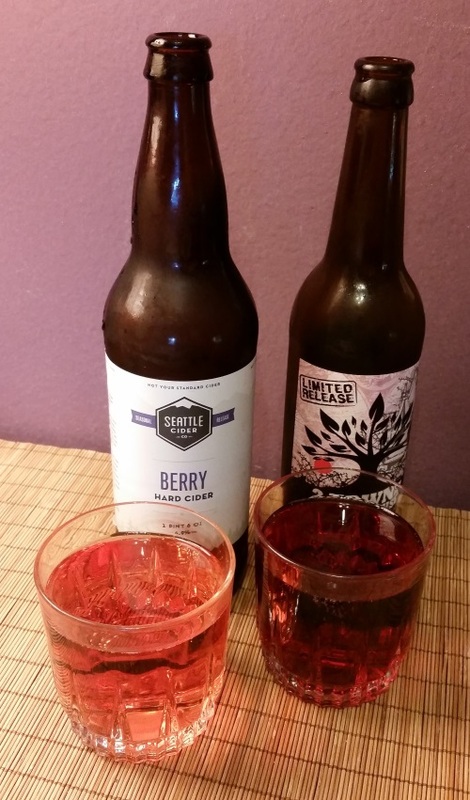 Despite the light, sweet aroma, Seattle Cider’s PNW Berry is quite dry, with some mild acidity and light fruit aspects coming through in the taste. It’s a fairly subtle interpretation of the “berry cider” concept (PNW Berry has a little blueberry in addition to the blackberry and raspberry). On the other hand, Throne of Thorns is sweeter, stronger in flavor, more tart — it really centers the berries and lets them assert themselves. Throne of Thorns is a shout where PNW Berry is a murmured aside. Overall: I wouldn’t say either one of these ciders is better than the other — they definitely both have their places. If there’s food involved, I would make sure to pair Throne of Thorns with something that’s going to stand up to its bold flavor, while PNW Berry could go with something that has lighter, more nuanced flavors. Posted in Cider. Tagged 2 towns ciderhouse, pnw berry, seasonal, seattle cider, throne of thorns. In journalism, the joke goes, three of something makes a trend. Spot three dudes with man buns? Trend. Three local residents cheesed off about sidewalks? Trend. So, three hefes mean my drinking habits are a trend too, right? I’d agree — if all three of those beers had actually been hefeweizens. Yes, that’s right Bad Riders, there is a traitor in our fridges. Two of those beers are delightful takes on one of my most favourite summer styles and one of them is basically a honey wheat ale thing waiting to dash all your drinking-related hopes and dreams. There are very few things I want from a hefeweizen. I like big, super bright banana flavours and sweetness in a not excessive amount. Maybe a little complexity to round things out, but I can be flexible on that. 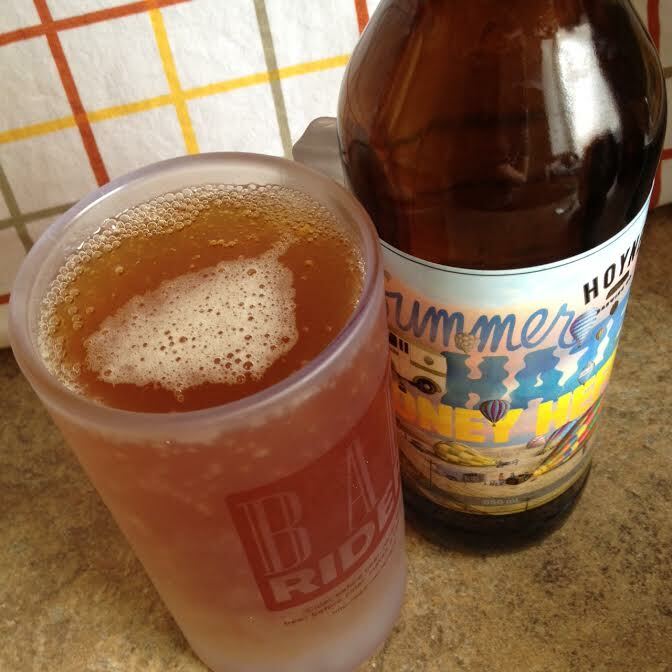 Which is why I’m so perplexed by Hoyne’s Summer Haze, which doesn’t taste anything like I’d expect. 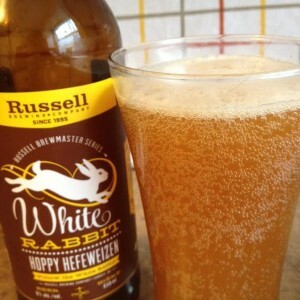 As I implied above, it’s more honey and ale, nothing that particularly says hefeweizen to me. OK, I figured, maybe I’m drinking this too chilled. But leaving a resealed bomber on the counter to come up to temperature is usually enough to release any flavours I’ve inadvertently ruined with my awful 60s-issue apartment icebox. Not so here. I don’t think Summer Haze is a bad beer. Had I approached it on different terms I think I would have enjoyed it. But what the heart wants, the heart wants, and it turns out what I really wanted was White Rabbit. Man, this is such a good beer. I didn’t think hops would contribute much to a hefeweizen, but it’s a bit like a sprinkling of salt over a dish. That little bitter citrus edge seems to define all those banana and clove flavours so much more. It’s the only beer where I really got the real, murky clove flavours so often advertised on bottle copy and rarely delivered for the less-trained (i.e. : my) palate. There’s also an interesting haziness to the sweetness of this one — much in the same way eating a banana differs from chomping into an apple. Needless to say, I’ve already purchased more. The one Kamloops-specific downside here? It’s not the easiest bottle to find. I’m only aware of one liquor store carrying it, and my last sweep of the government stores was no help. 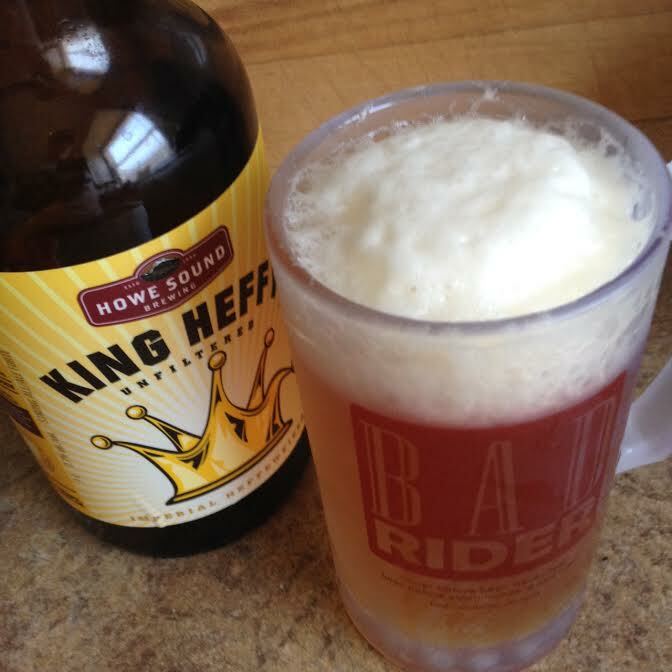 Compare that to the final beer of this trio, King Heffy, which is pretty much everywhere now that summer beer season’s begun. I didn’t find the King quite as complex as White Rabbit, but it does what I ask. The banana is bright, the sweetness just right. I think the wheat is a bit more pronounced here than in White Rabbit, and it’s not as smooth-tasting overall, but there’s a reason this big guy’s a liquor store staple. And, hey, who’s going to turn down a bottle with enough room to contain a third glass of that delicious summer nectar? Posted in Beer. Tagged 650mL, Howe Sound Brewing Co., Hoyne Brewing Co., Russell Brewing Co., seasonal. Every time I think “one of these days I’m going to run out of cider,” I realize there’s a cidery I haven’t reviewed anything from in months, if ever. In this case: Blue Mountain Cider. 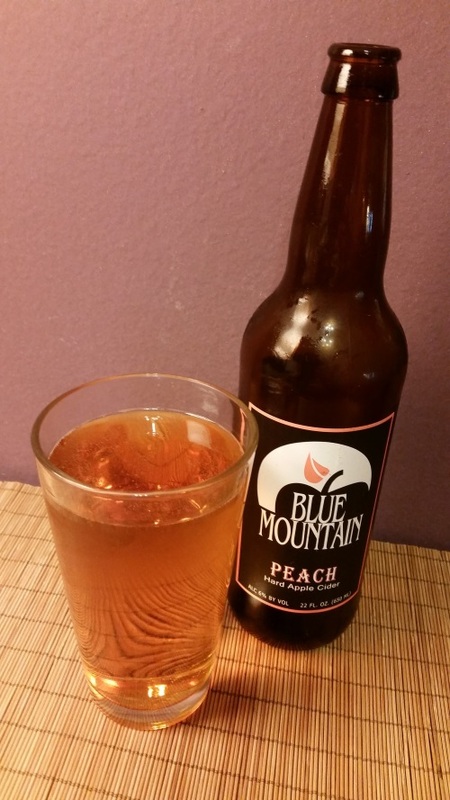 Blue Mountain’s Peach seasonal cider is 6% ABV and clear with a definite orange hue, presumably owing to that extra boost of peach. It has a light aroma, with a little tart acidity drifting in at the back. The flavor is much more sweet than dry, but acidic and tangy, the peach more or less blanketing the apple. Try this cider with a pork dish, I think, or maybe salmon – it’s probably too strong for a mild seafood dish and not strong enough for something with rich red meat. Blue Mountain has been around for a while, slowly growing and expanding their operation over time. They don’t have a cider locator, but you can buy directly from their online store, and they even have a cider club membership you can sign up for (I am sorely tempted). Posted in Cider. Tagged 650mL, blue mountain, peach, seasonal. Big day for Bad Rider reviews: our first freebie! The kind folks at Schilling messaged us on Twitter recently to express their appreciation for our reviews, and even comped me a bottle of Spiced Cider from Schilling Cider House in Fremont after I mentioned wanting to compare it to the Chaider in last week’s review. 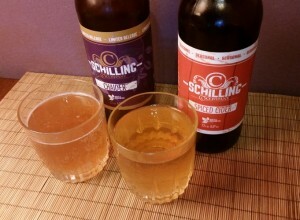 Many thanks to Marc at the Cider House and to whoever manages Schilling’s Twitter account! It is a little unseasonal to be drinking a Spiced Cider in February, but I’m hardly one to turn down free booze — especially when it’s For Science. And sure enough, now that I’m trying them side-by-side, the Chaider and the Spiced Cider really do have a lot in common. Where the Chaider was cloudy, the Spiced Cider is a quite clear, a bit lighter in color, and a slightly stronger 6.9% ABV to Chaider’s 6.5%. The aroma and flavor of both bear strong similarities of cinnamon and clove, though oddly I find the aroma and flavor of the two are in opposition when compared — the Spiced Cider smells more peppery than the Chaider, while the Chaider tastes more savory and complex. I suppose it’s good for balance in either case: let the sweetness and cinnamon come through early in the aroma of the Chaider to balance the earthiness and spices to come in the taste, and let the Spiced Cider hold some kick in its aroma to offset the greater sweetness of the flavor. Perhaps it’s just the associated of certain smells with pumpkin pie and eggnog and general holiday festivity, but there’s an aspect to the Spiced Cider that’s almost a little — eggy? Custard-y? It’s hard to capture and put down on paper. Perhaps it’s just the pumpkin notes mentioned on the bottle copy. In any case, it’s a smoother, softer, round-er sort of taste overall than the Chaider. Both of these are good and interesting ciders — though my personal preference would be for the Spiced Cider more specifically during the winter holiday season and the Chaider as a more season-agnostic option. You can get either at Schilling’s Fremont location, or find a more local option via their site. Posted in Cider. Tagged 650mL, chaider, schilling cider, seasonal, spiced cider. Special Agent Dale Cooper would approve. Yup, To-fine-o Brewing again. I can’t help it, guys. I’m a sucker for porters. Also, I was too lazy to make coffee on the morning of the day I tested this and by 5:30 p.m. was hurting for a cup of the black stuff in the worst way. Lucky for me, Dawn Patrol delivers. This isn’t some run-of-the-mill ‘notes of chocolate and coffee’ beer. 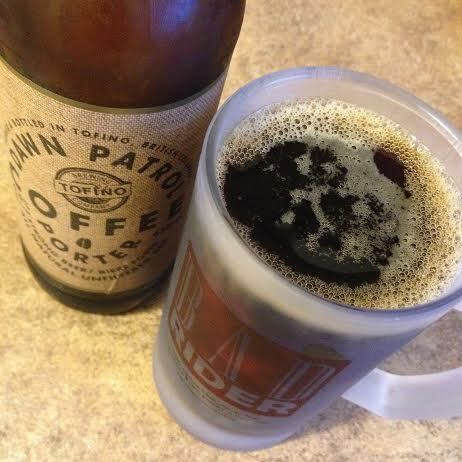 This is coffee as beer. My poor, under-caffeinated soul could not have asked for a purer fusion of the two. First, it nails the scent. Imagine taking a whiff off a good bag of corse-ground beans, about a medium roast. There’s a bit of a beery background as well, but it’s predominantly coffee on the nose. If you’ve ever had a really good cup of cold-brewed iced coffee, you’ll recognize a lot of the notes in this beer — which plays a bit like a sharp, fruity espresso, but with the rounder, mellower tones that come from a long, cold steep. Even the bitterness here is characteristic of coffee rather than beer. If I didn’t know it’d actually be vile, I might assume this was cold brew with beer in it, rather than beer brewed with coffee. I think the darn thing even fixed my caffeine-withdrawal headache. That’s not to say there’s nothing beery here. You’ve got a light carbonation, and a little bit of maltiness you’d be hard pressed to get from anything on offer at your average Starbucks. There are some background tones of vanilla as well, though they’re easy to miss in all the coffeecoffeecoffee excitement. It should go without saying that this is not a beer for you if you don’t like coffee, but I’ll say it anyway. Don’t drink coffee? Don’t drink this… leave more of it for me. Posted in Beer. Tagged 650mL, seasonal, Tofino Brewing. CHECK OUT OUR AWESOME MUGS! Does anyone want one? Let us know! My last interaction with maple in cider was Woodchuck’s spring seasonal, which was (to my own great surprise) not particularly to my taste. Usually I will be first in line for anything with maple and brown sugar. Perhaps it’s something specific to maple in cider, because this Oaked Maple is also…weird. It starts off well enough, with a straightforward apple aroma and some of the oak notes underneath. When I taste it, I get maple — but scarcely any sweetness. Which is bizarre, right? Maple should be sweet! I have a hard time wrapping my head around something tasting like maple but not being sweet the way maple-flavored things generally are. 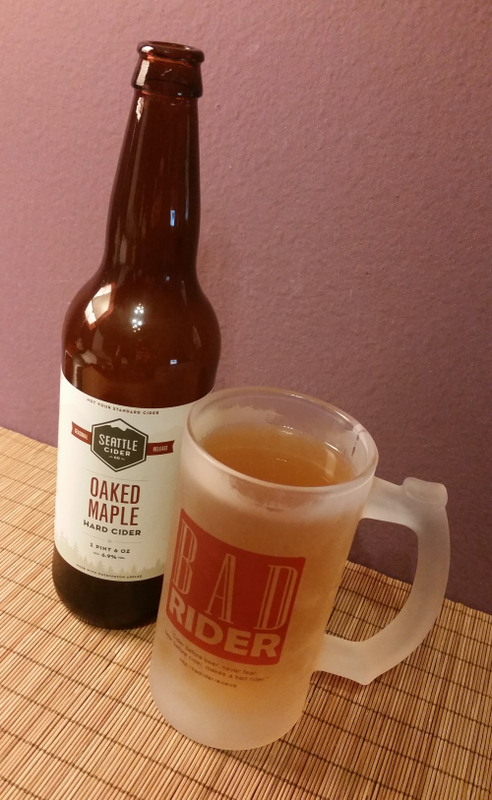 Other than the strange non-sweet maple taste, Oaked Maple is fairly tart, and a little bitter. The bottle copy says it’s fermented with oak chips and raisins, and there is something of wrinkly dark fruit about it, an aftertaste like raisins picked out of a cake. Seattle Cider needs to keep their website up to date (AHEM), as it currently only lists Pumkin Spice and PNW Berry as the available seasonals, but you can still use their locator to track yourself down some cider here. Posted in Cider. Tagged 650mL, barrel-aged, oaked maple, seasonal, seattle cider. 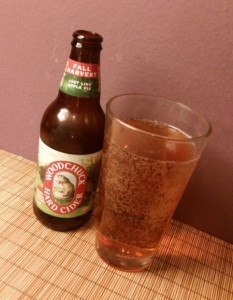 With their fall seasonal release, Woodchuck is going not for pumpkin pie but for apple pie, and not for an explosion of spices but for something sweet and evocative of particular flavors without being overpowering (Seattle Cider I’m looking at you). It’s a clear, dark amber and only 5% ABV, with a mild and sweet aroma of nutmeg and cinnamon. The taste is (unsurprisingly) also quite sweet, with smooth vanilla and a little apple tartness. All in all, a respectable entry into the fall seasonal category. Reminds me a little of the Neigel Pearfect Pie I tried at the Seattle Cider Summit, but less aggressively pie-tastic than I recall that one being. Every cider I’ve had from Woodchuck has been on the sweeter side, but not so much that I feel bad recommending the ones I’ve liked to other people who like sweet ciders. Sometimes I’m not a fan of their flavor choices (like, surprisingly, the winter seasonal), but overall I trust them to deliver pretty solid commercial stuff. Find yourself some Woodchuck here! Posted in Cider. Tagged fall harvest, seasonal, woodchuck cider. 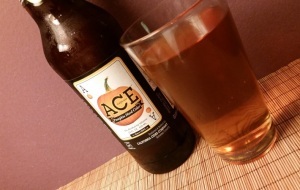 Hailing from California, Ace is not the local-est of local operations, but in my quest to bring you comprehensive coverage of pumpkin ciders I’m allowing it. Buuuuuut I’m allowing it for one specific reason: to bring you a warning that it’s bad. To start off with: it smells bad. Yes, there are spices there, and even some pumpkin. There’s also a smell that I most strongly associate with Nickelodeon Gak — that kind of sharp, chemical, plastic smell. The taste never really makes up for the smell, nor does it particularly distinguish itself. It’s almost anticlimactic: sugary and pretty stock apple-juice with a side of pumpkin pie spices. Don’t look for some Ace Pumpkin cider of your own. Try some Crispin Steel Town instead – while not strictly speaking a seasonal cider, given the competition it’s turning out to be one of the better ciders I’ve tried this fall. Posted in Cider. Tagged ace cider, pumpkin cider, seasonal. For better or for worse, cider has become popular enough over the past few years that some cider makers are starting to hop on board the Pumpkin Spice bandwagon in fall. 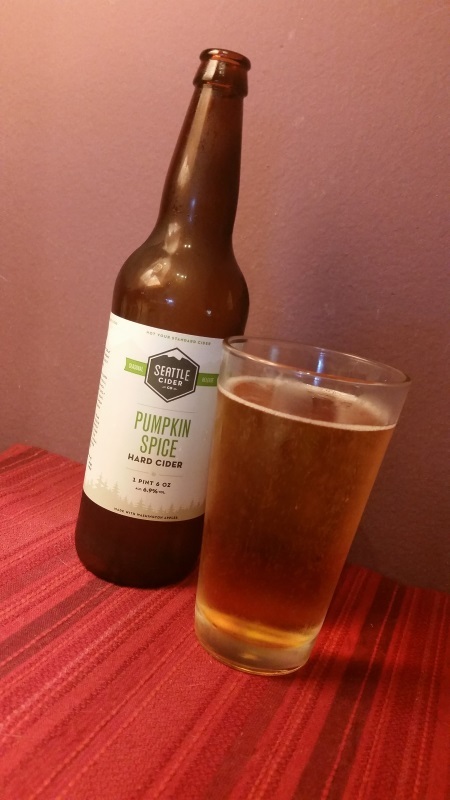 While I won’t be running an actual bracket like Andrea, I will of course round up all the pumpkin and pumpkin spice ciders I can get my hands on and review them for you, in addition to any other autumn seasonals I find. And anything else that’s generally thematic, while we’re at it (Angry Orchard Straw Man, I’m looking at you). We start today with Seattle Cider’s Pumpkin Spice Cider. This is definitely more of a spice cider than a pumpkin cider — the bottle claims cinnamon, nutmeg, allspice, and cloves followed by “just a touch of pumpkin,” but if the pumpkin’s there at all it’s extremely understated. Cinnamon and cloves dominate the aroma; the other spices come forward in the flavor to mingle with the apple. If this were an actual pumpkin pie, or even an apple pie, I would sigh and make adjustments to my recipe, because the proportion of spice to fruit/squash filling is way out of whack. As a cider, it’s fine — just as long as you’re aware you’re on the express train to Spiceville and that’s where you want to be. I bet it would actually be pretty good mulled with an orange (NON clove-studded, plenty of clove in there already, thanks) and maybe some rum. It’s medium/heavy fizz, golden in color, and 6.9% ABV. If you’re in WA, OR, MI, or AK, you can find some for yourself here. Posted in Cider. Tagged pumpkin spice, seasonal, seattle cider.